My blood was boiling… my fists were balled up… my gut wanted to yell, “Let’s take this behind the barn!! !” She was in my face, screaming. We were standing in the front office with students, parents, and other teachers trying not to stare, without much success. I stood there because I wanted to hear her excuses. I wanted to see if for one moment she cared enough about this student to claim him or be concerned for his welfare. She never did. And because I stood there, I got written up, too. She had not taken responsibility for one of her students with special needs. She had pawned him off on as many others as possible. She had lost track of where he was, and when she got caught, she pointed fingers at me as the Resource Teacher. Clearly, lack of communication caused the problem in the first place. 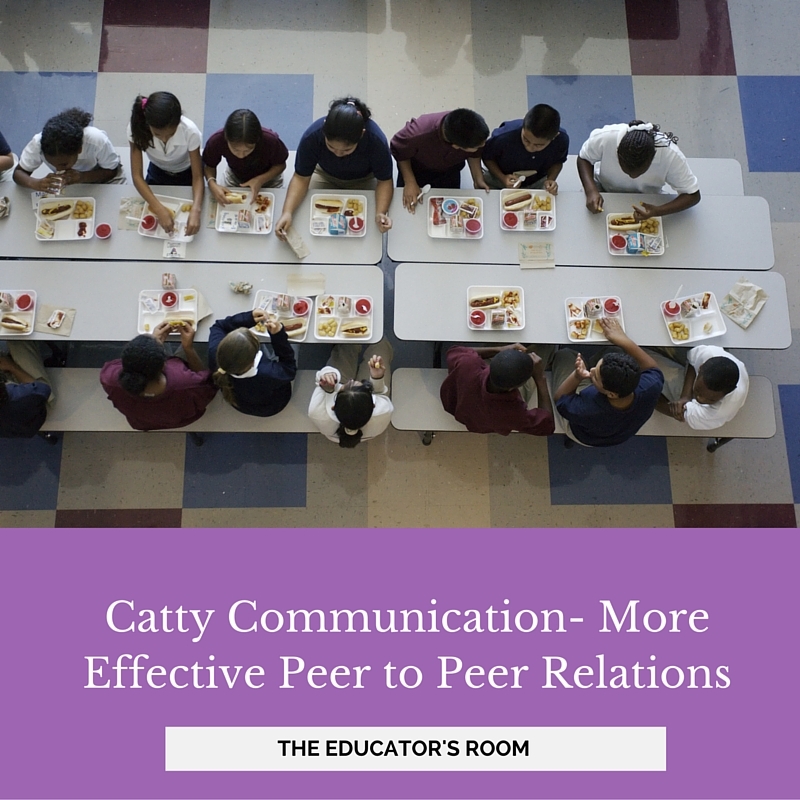 Communication between peers is difficult for many reasons, not the least of which are time, effort, and personality (or lack thereof). Every teacher is pressed for time. We are also tired, so that student that requires the extra effort could easily be the one who suffers because we didn’t have that extra ten minutes to reach out via email, phone, or in person. Sometimes we just don’t have that extra two ounces of energy at the end of a long day. But personality is the piece I want to discuss with you, my fellow educators and administrators because I think we are missing a key point. People will treat you the way you permit them to treat you. Set your limits and speak them aloud. It would have at least let them know that I was not going to sit down for Mean-Girl nonsense. But I ignored it, thinking I wouldn’t give them the satisfaction of knowing it bothered me. What I basically told them was they could act childish and mean, and I wouldn’t confront them or hold them accountable. So this meanness continued until our escalation that I previously mentioned. Take action immediately to avoid emotional responses. When I know something has happened and I must wait until tomorrow or next Monday to deal with something, it eats me up. I stew. I think too much. I question myself. The worst thing I can do is call my Teacher-Pal and talk about it. The emotions escalate so that by the time Monday rolls around, I walk into Mrs. Nemesis’ classroom ready for battle. There are times when we have to walk away to get ourselves under control. Believe me, I’ve been there! But taking care of business before you go home for the day or the weekend can save yourself an ulcer from stress and give you more peace on the home front. Resist the temptation to gossip about it afterwards. The first thing I want to do when something big goes down is talk to my husband about it. In his absence, my Teacher-Pal will do just fine. I think it’s our instinct to want to share our triumphs and sorrows with a friendly ear. However, the more we talk about it, the bigger it can grow in our own minds. We frequently make things bigger than they have to be because we spend too much time examining them, talking about them, worrying, and gossiping… Deal with it. Let it go. It’s so easy to say and so hard to do. Document like you would for an incident between two children. In the case of Mrs. Nemesis, her mistake was that I teach Special Education. I write down everything, just in case. If you are documenting behavior in your classroom to determine the function of the behavior, the frequency, or the consequences, you become a little more analytical. Every behavior has a function, right? Not only does this help you identify patterns in Mrs. Nemesis’ behavior, but it also allows you to disconnect emotionally. The best part about all my documentation was that when I was written up, I brought said documentation with me when I got called down to the Principal’s office. At first, I looked like a tattle-tale; however, when presented statistical evidence of the behaviors, it began to look like what it really was: harassment. Remember that at the end of the day, (hopefully) you aren’t married to your nemesis. We all go home to our own cozy recliners, in our own homes, with the family we either chose, gave birth to, or are somehow otherwise obligated to put up with. (Yes, I ended that sentence in a preposition. Deal with it.) Your nemesis goes home to his or her home as well. Work, at the end of the day, should not come home with you. Now I’m going to be honest with you. I eat, sleep, and breathe my job because I change lives every day. Perhaps it’s an inflated sense of self-importance, but I choose to believe that I matter and make a difference. I have to be the one to remind myself that if Mrs. Nemesis gets to me, it’s my students, my family, and me that are most affected.